The time to explore topics, learn from others, hear presentations, discover new ideas, and provide your input will be at the interactive sessions facilitated by your colleagues. This year, workshops are focused on three themes: Streams Lead to the Ocean - All About ToP Methods; Tidal Force of Change - Engaging Communities; and Riding the Wave - Innovations in Facilitation. 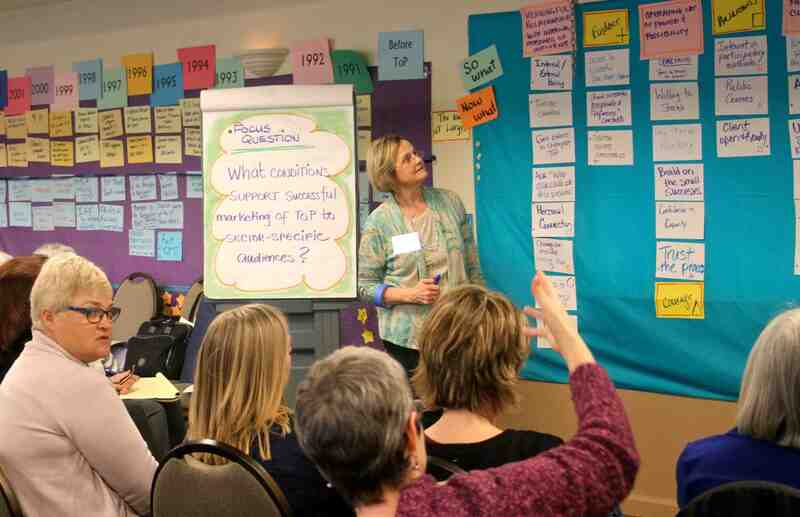 Learn about the ToP Facilitation Methods training that was delivered statewide to staff members involved in the CA Dept. of Public Health Supplemental Nutrition Assistance Program-Education (SNAP-ED). We will work with the California case study to design and deliver a large scale ToP training program for more than 400 participants in three months. To create an inclusive and just society, leaders and consultants need to examine the ways they may unwittingly perpetuate racism, white supremacy and other forms of oppression. We will review the neurosciences underlying implicit bias and how it impacts attitudes and behavior, and we'll discover strategies to uncover and interrupt implicit bias. ToP Training and facilitation methods are part of a larger Global mission held by ICA. Come learn about ICA's mission, the 'why' of the organization, and how your work supports it. Currently, ICA has a wide variety of methods based community engagement projects - come also to learn about them, our community development training curriculum, and share your innovative community work as well. Join the forum members to hear how they are working to ensure the success of ToP Training. Learn about what they are working on and provide your input. Learn why our well-designed, well-facilitated group sessions sometimes fall short of creating the change the organization seeks. We will explore the key ideas from the book An Everyone Culture: Becoming a Deliberately Developmental Organization. We will explore the importance of supporting individual change in order to create organizational change. We will discuss the development of appropriate and substantive evaluation of ToP methods, especially in the context of public health. We'll examine logic models and program theories being created to help us clearly articulate our objectives (in TFM especially) and discuss what evidence would demonstrate that we are – or are not – meeting our objectives. In this session we shall introduce the ORID model, first by demonstrating the ToP Focused Conversation method in leading a conversation on the role of the facilitator, and then by talking through the theory behind the model and by giving some examples of broader application as a universal principle of process design and facilitation. You'll have an opportunity to consider how you might apply the model yourself in your own situations, and what you can learn about your own ‘universal principle of facilitation’. In this session, we will apply improvisation principles to ToP facilitation. You will be able to transfer these exercises when you want to establish rapport and be playful and practical. You'll increase your comfort with thinking on your feet and taking a more creative approach when working with groups. At this session, lead by the Certification Team, observers and candidate groups will review the observation experience and discover common challenges. We will compile a list of best practices for observer and candidate. This is a working session where we will delve into how to elicit better underlying contradictions from participants during a Participatory Strategic Planning session. Learn about this new course, developed by an international team of ToP Trainers. Explore the ToP tools and see some new ones for engaging a client in assessment, management, creative engagement, and contracting of a client in collaborative ways. The group will help enhance and sharpen the 2-day course. Groups can't always commit to a 2 day strategic planning event. Learn about an abbreviated strategic planning process that can be done in 6-7 hours with a group. This combines the ToP action planning and ToP strategic planning processes to create a streamlined agenda. Come sing with David Roth! Take a deep breath and enter the laboratory of no wrong notes where even the chronically timid are encouraged to embrace the natural singing ability we ALL possess. Group soundmaking, songs, rounds, chants, yawns, sighs, guffaws, dreams and desires will provide the foundation for our time together. Through narratives and highlighted themes from Peter Block’s book, Community; The Structure of Belonging, participants will explore concepts of courageous conversations, community healing, and social justice work using ToP methods. Participants will learn about an innovative marketing approach that engages community. The session will provide space to generate strategies for their individual work and markets. Learn a Successful Project Framework to charter teams. This process is especially useful when participants represent multiple agencies or organizations. Specific tools to clarify mandate, scope, resources, ad hoc operating agreements, and decision making structure will be shared. A case study from California state government related to climate change will be presented. The Boards of ICA International and IAF have recently appointed a joint Working Group to explore how facilitators among the wider IAF and ICA and their facilitation communities worldwide might find ways to support each other and collaborate more. This session will share what is happening with the working group, and ICAI & IAF, and seek your input on ways the two organizations might collaborate and/or support each others work and members. Learn how to design an event that sings. Explore how you gather relevant information, set objectives, apply methods, and prepare for the event. We'll do some peer coaching on design challenges you face.